An 8-year-old girl said, “We have woods, but can’t go anywhere near them. It’s too dangerous.” The kids went on to tell me they weren’t permitted to swing on their bellies or spin in circles, for fear they may get dizzy. “When we have standardized testing, we don’t get recess. The teachers give us chewing gum to help us concentrate on those days,” another child announced. Wow. ‘m so old I remember when gum was forbidden — and hanging upside down was not. We encourage children to go upside down, to jump off objects, to climb to new heights and spin in circles to give them a better sense of body awareness. All of these rapid and changing movements shift the fluid around in the inner ear to develop a strong vestibular (balance) sense. A unifying sense, the vestibular system supports good body awareness, attention and emotional regulation. These skills are fundamental to learning in the classroom. Just like our muscles, if the vestibular system is neglected due to repeatedly restricting movement, it can weaken over time. This is one reason why many adults claim that they were able to tolerate rides as young children, but now feel sick or nauseous on the Ferris wheel or Tilt-a-Whirl. Many of us aren’t moving in a variety of ways like we did as kids. Lets face it, keeping children sedentary for most of their waking hours is causing harm. Okay, our job is to show this information to principals, superintendents, parents, pediatricians, police and politicians. Kids are born to move. They must move. Even their grades and test scores NEED them to move — Hanscom prescribes three hours a day. If they’re not getting that kind of freedom at school, push for it, while also trying to give them free time before and after school. Fight excess homework. Look for fellow Free-Rangers who’d like their kids to play outside with yours. 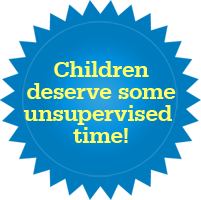 Consider cancelling one supervised, scheduled activity and replacing it with free time. Make sure your town appreciates that kids can and should be outside, running around. And let us know if and when you do any of this, or if your school or city comes around. My kids’ school banned homework a few years ago. It can be done! – L.
DO NOT HANG UPSIDE DOWN! Great post and great article. I really enjoyed reading it. It makes so much sense from a physiological point of view. I suspect that emotional well-being benefit from this as well. How well can you handle “change”? If you’ve experienced changes, one more change is not so bad. But never having experienced change, well, that’s a newborn, isn’t it? “What do you mean I don’t get fed when I want?” The emotional difficulties of life are nothing but a response to change, and if we insulate ourselves too much, we become weaker. Of course, that is not to say all change is good, because I can already hear people complaining (I can even guess their handles). Just like jumping off the side of a building isn’t a healthy form of movement, there are emotional crises that should be avoided if possible. 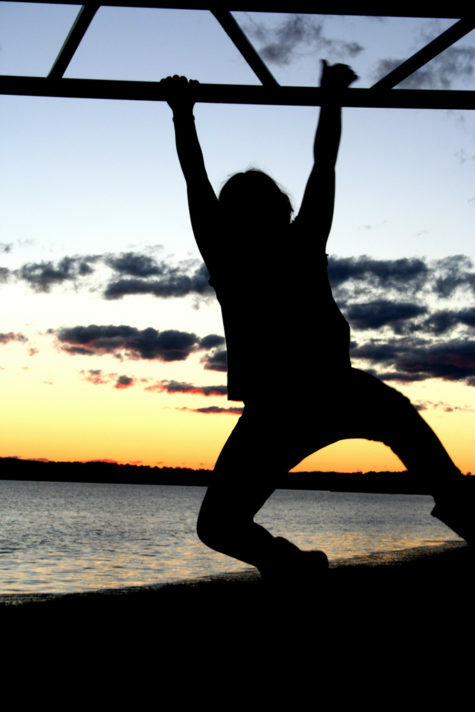 But a healthy dose of emotional agility allows us to overcome the usual variances in life. Alternatively, we could become crybullies who demand safe-spaces and play-doh when we encounter difficulties, shouting at those who dare tell us to go outside and run around a bit before dinner. It’s not just emotional well-being for the kids either. I felt a lot better the other day – when my boys were making me want to tear out my hair – when I pointed to the door and said “go to the park!” When they finally returned, they were calmer, I was calmer, and I had been able to get some things taken care of while the littlest one was sleeping. I find the days where we’re at each other’s throats are the days that they haven’t been outside. As an aside, in my elementary school, I remember only one – maybe two – playground monitors, and they didn’t care what you did as long as you weren’t hurting another kid. I also remember at least two recesses a day, and one teacher I had granted us an extra one at least once a week. Might be time to bring that back. Follow it up with a study that shows increased test scores (and a decrease in medical costs), and they’ll be shoving the kids out the door. This is just one of the many reasons that my husband and I plan to homeschool our son. He’s only 16 months old and he’s already on the go all day. I can’t even imagine how crazy it would be to send him to preschool/kindergarten in a few years and expect him to sit still for more than ten minutes?! We would much rather allow him freedom to be a little kid- run and jump and climb trees and throw things and all the stuff that his peers won’t have time for/ won’t be allowed to do because of “safety” concerns. We weren’t allowed to spin or go on our stomachs on the swings when I was in grade school either(20 years ago) but not because the teachers were afraid we’d get dizzy–it was because the material under the swings was sharp gravel and the school nurse got really really tired of tweezing gravel out of gnarly skinned knees/calves. Times have changed. You have contributed to an interesting education. Apparently if you search the net on the topic of “recess creativity” some of the important links to come up are on the topic of Waldorf schools, which I had not particularly heard of previously. Back when I went to grade school, we had recess or PE at least once per day. I don’t remember what “we” did during rain . . . which is a frequent “problem” in our locality. Anyway, if you research on the topic of “recess creativity” you will find one or more webpages which claim that the average schoolkid now spends less than 10 minutes a day in unstructured play activity outside, which seems unreasonably low to me. Supposedly Waldorf type education kids spend more time outside in structured or unstructured activities. Supposedly the test scores of the kids come in about the same (compared to usual public education kids) in some measures, with some interesting positive surprises in others. supposedly there was a school in Yuba California which adopted a Waldorf approach and one main result was higher student satisfaction. Even if the “test scores” seem to be the same, a school system which is able to attract and retain more students and bring them to graduation is actually doing better. If you’ve read any material from the Institute for the Achievement of Human Potential in Philadelphia, they strongly prescribe aggressive work on monkeybars (brachiating), crawling and other physical programs to repair brain damage and maximize intelligence in hurt or healthy kids. I could be wrong, but some of your areas of discussion include the approach of various schools in safety/play/arts of the kids. I went to public schools all my k-12 life and so I do not know what Waldorf schools are like. However, they seem from the few items I have just read to put more time into outdoor activities and the arts than the usual public schools. It seems to me that a schooling approach that encourages play, imagination and the arts and recess and the outdoors, and which is proven by studies to have some beneficial effects on “student achievement,” would be exactly the thing you wish for. And this is exactly what is exasperating the problem! Because of increased “clumsiness and falls”, more idiot rules are put in place for the purpose of restricting even more movement by children. So the more restrictive the children’s movement are, the clumsier and more uncoordinated children become! It becomes a never-ending downward cycle. School administrations seem absolutely clueless to this. Where does one begin to educate them and actually convince them of this fact? My homeschooled seven year old constantly takes breaks to do headstands and pull-ups! It’s too bad that occupational therapists have to “encourage ” kids to spin in circles, climb, etc. This kind of activity should occur naturally and without instruction. I have modernized this for the outlook of today. To do so, I’ll pretend that I’m speaking through an 8 year old child. I am not smart enough to open a car door or window and am in danger of a car turning into a solar oven if I get into one unsupervised. It depends on the student. My 15 year old daughter used to take karate breaks now she is taking step dance breaks. She was getting tired last night and that perked her up with enough energy to finish her 9th grade public school homework. That is fascinating information about the physiological benefits. Of course, it already felt right on a gut level, but I always like to have actual research to back up my gut so I can explain it to people. I don’t have kids yet but I am thinking seriously about it and that is why I am weighing all of these different issues. Some of my concern about having a child has to do with the overparenting culture. Likewise, I think I probably will need to leave New York City before too long because the cut-throat preschool culture here is so absurd to me, yet I’m afraid my own insecurities and competitive nature might have me going along with some of it. This is one of the reasons I am drawn to the idea of Forest Kindergartens like they have in Germany where the kids play outside all day, year round. There are a few in this country now and I believe they are growing in popularity. So now we must justify recess by pointing out its effect on test scores. And the vestibular system. Isn’t the core issue fear of litigation if the kids get scratch or negligence can be charged ? but thousands doing nothing won’t sue you. I’ve seen the physical effects from lack of play while coaching youth sports. Spacial awareness, agility, and balance don’t develop unless the body is routinely exerted. I have players who can do skill drills perfectly, but in game situations, you have to remind them to look up for other players and not down at the ball. If they collide with another player, it’s “Hey! She was in my way!” and not that they caused the collision. This natural dexterity that develops those cat-like reflexes is becoming increasingly rare. On a positive note, I had an encouraging parent-teacher conference for my daughter in elementary school. The classroom is set up like nothing I’ve ever seen. Her teacher explained that she is not a fan of sitting (my daughter has a standing desk) and encourages the kids to be moving and learning. She set up work areas for completing assignments and has an outdoor courtyard that the class rotates through daily (they are learning life cycles through composting now). The teacher explained that SHE needs the movement too to stay fresh and enthusiastic. We spoke nothing about tests during this conference, just learning styles and individual habits. How refreshing! Such idealistic protectors of children’s health and safety! After all, who’s afrid of lawsuits? I was sitting on the edge of the non-swimmers pool watching my 6yo and 4yo splash around. There was another mum there, with what looked to be a 3yo, the kid was tall but had floaties on both arms (in water that was shallow). The mum was in the water with him and was clearly bored “Come on, lets go in the big pool” she kind of begged, but he refused, saying “Its dangerous”. Such a big word for a 3yo, you could tell she was doing what she thought was right, but the result was a child too scared to go in the big pool with his mum and floaties…. Society as a whole doesn’t give a toss if the kids grow into anxiety ridden adults… as long as they don’t die getting there. @Workshop- my husband likes changes and has been known to decide at 9:30 at night to rearrange furniture, just for the sake of changing something! Life in prison without parole? At least they get to keep their Blackberries and email servers and video games. Who elected these boards of education anyway? Can’t something be done? We in the USA are learning that lawsuits are a great way to get rich and avoid paying contractors and taxes. Fear of lawsuits is passé. Let us let the kids go out and play! Everyday should be Send Your Kids To The Park Day. Spin and twirl and tumble and whirl! I shudder thinking of a childhood in which all a kid hears is “Don’t do that”. My second grader still has recess and breaks during the day. However, she routinely complains that they aren’t allowed to go upside down on the monkey bars and aren’t allowed to sit on the top of the climber. I always wondered why kindergarteners weren’t allowed on the playground until October or so. It turns out that it’s because the playground equipment is designed for ages 5-12 and the last kids turn five at the end of September. Because magically, one day, they are suddenly imbued with new skills that they didn’t have the day earlier. I get that schools are covering their liability, but when are these kids supposed to learn risk taking and confidence if not on the relatively safe confines of the (heavily mulched) grade school playground? Therein lies the problem. The American mindset is, they’re just children and children are our future but children are very tender, therefore, as big strong adults we must protect children, who are tender, from harm. Failing to do so is inexcusable and we must take a 0 tolerance approach toward any adult associated with or even near a child who even skins his knee. Typical American over reaction. In order to stop this litigation nonsense, Judges with common sense need to throw these lawsuits out before they get started. Once that happens, there should be no need to fear these frivolous lawsuits and kids can become kids again! Mass supervision of children must, I suspect, lead to an ‘us vs them’ attitude on the part of the kids. I see a lot of hints of this. one example; I see one hell of a lot of teenagers smoking cigarettes. Yet The Authorities claim that teen smoking is at an all time low. I’ve only dug into those figures a little, but they seem to be based on ‘anonymous’ surveys. I suspect what is at an all time low is teenagers credulous enough to believe that if they admit ‘anonymously’ that they do something illegal (like smoking cigarettes) they won’t get in trouble. Let them alone, within reason. Let them MAKE mistakes. Let them come to you, bleeding, without you losing your mind. Let them get used to the idea that you will enforce the Big Rules, and let them deal with the small stuff. Let them come to you when they need help, or want to show off, and otherwise give them some freaking ROOM. Reports of falls on the rise could also be the result of overprotective policies. I have lost count the number of times I have been called to a school because someone has “fallen”. Not “fallen and hit their head and were knocked out”, not “fallen and now a bone is poking out”, or any other problematic fall. Just “fallen”. I used to scratch my head at all these calls until I was patching up a nine year old who fell off the play equipment. By patching up I mean having a chat about where hurt (his wrist hurt a small amount, but he could still move it fine. So, the most we were going to do was maybe pop him up to hospital for a precautionary x-ray)… when the parents came in. Screeching about how unsafe the play equipment was, how it should be removed, how they were going to sue (and keep in mind, we have universal health care. There is no need to sue for medical costs the vast vast vast majority of the time). Now I know why we keep getting called to “fallen”. What’s wrong when children can’t explore of their free will? The restrictions placed are overbearing. Beleve it or not, chikdren are built to take falls as their bodies are quite maneuverable and pretty sturdy. When I was a kid, there were no such restrictions and we did whatever we wanted as long as we knew what we were able to do. Of course we can hurt ourselves but we also heal rather well. If that were not to be then there would be no football, baseball, soccer or any other sporr that requires risk. Certainly there wouldn’t be any Olympics as there won’t be any competition. How sad would that be. You have to know your risks and use common judgment plus practice, practice, and more practice. Thank you for this wise and challenging blog. I regularly refer learners to both Free Range Kids and Tindernook. I train educators, parents and play workers to use natural, wild spaces with their children. Showing them through Forest School that children and young people are capable, creative and great at managing their own risks when empowered to do so. Schools in the UK are now using Forest School to improve outcomes for children…ensuring that they give children regular, extended periods of time to play and explore in woodlands with supportive skilled practitioners who have qualified as Forest School Programme Leaders. I recommend your readers look up the Forest School Association and see if this could be an approach for them. We are now training practitioners from overseas. I feel it is not just the games themselves that children miss-it is the joy of imparting rules and skills to their peers-and to younger children.-and seeing the results. In 1979(I was 30)at a community picnic, I taught the rules of ‘Run, Sheep, Run! to 6 boys. The boys passed on the rules to their peers. By two weeks time, SIXTY additional children had tried the game.